Bill stood waiting about a mile away when this photo was taken. November 22, 1963 was also a Friday, and class was suddenly interrupted. An early dismissal was announced; I don't remember if we were told of the President's death, or just sent home to find out. I had just returned to school because I walked home for lunch each day. My younger brother remembers coming home to find mom ironing, with tears in her eyes. Bill's experience is much grander. He seems to remember being in his dorm that Friday afternoon. As funeral plans became public, Bill and a college buddy, Charlie, decided to be a part of history. The next day they got a ride to the Ohio turnpike and patched together a series of rides to Washington, D.C. Bill, Charlie and their driver rode through the night as Kennedy's body lay in repose at the White House. By daybreak, the trio pulled into Gettysburg, the battlefield awash in the dawn of November 24. Then it was on to D.C. where the wide-eyed young men were given a tour by their chauffeur: the Washington Monument, Lincoln Memorial, White House and appropriately, Arlington National Cemetery. "Absolutely amazing," remembers Bill, seeing Washington for the first time as it prepared to bury the nation's Commander-in-Chief. 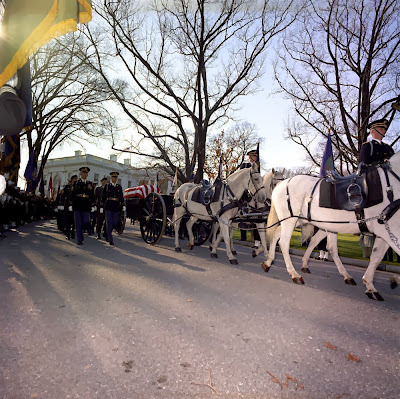 By mid-morning, the procession with a horse-drawn caisson carrying Kennedy's body left the White House en route to the Capitol where the President would lie in state for 24 hours. Bill and his companions found a spot on a curb to witness history. "I will never forget the somber, rhythmic echo of the horses' hooves down Pennsylvania Avenue, seeing the flag-draped coffin and riderless horse," Bill says. Afterward, Bill and Charlie's driver said, "I'm headed west, you guys want a ride?" Knowing they had classes the next day, they accepted and rode back to Ohio that afternoon. Bill doesn't have an impetuous bone in his body, so I find it amazing he gave no second thought to a 24-hour adventure. At the invincible age of 18, he probably didn't realize the magnitude of tasting and witnessing such an historic day. I imagine the kind driver saw the bigger picture and the sacred role he played in walking a couple of Ohio boys through 24 hours of history. My dad was the person who knew me longest in life, nearly 59 years: more than twice as long as my mother. While I'm not sure he knew me the best of anyone, it's possible he did, more than I realize. Even when years and distance separate you from your child, don't you know him well? I know what will make my children laugh, what touches them, what they like to do, and how they might answer a question. But as dementia claimed Dad's mind like an enveloping fog, I was incredibly saddened that he became more and more distant. Dementia is cruelly possessive, it claims a victim as its own. In the last year of his life Dad didn't ask about my family; not my husband, children or grandchildren. He slipped from us bit by bit. The many photos we sent filled his bulletin board and on occasion would catch his attention. But in the last month he asked Lisa, his attendant, to take them down. "I'm going to Memphis," he told her. Memphis is where he was buried. I believe God's declaration, you created my inmost being; you knit me together in my mother's womb (Psalm 139:13) and I wonder if and how the souls of babies awaiting birth are hanging around heaven. When I first met my grandson Ethan, it fascinated me that he loved to put his head way back and stare straight up. Jill and I took the children on a short walk and Ethan gazed up at the sky the whole time, as if looking for something. It made me wonder. Although Ethan was born five days before Dad's death, did they somehow meet? Whose paths cross in heaven, and when? I do wonder, but God reminds me in the Bible that He has things well in hand. And thankfully, this world isn't all there is. So we fix our eyes not on what is seen, but what is unseen. For what is seen is temporary, but what is unseen is eternal. high school in 1943 entered military service. It was the war in which most everyone felt a part: World War II. 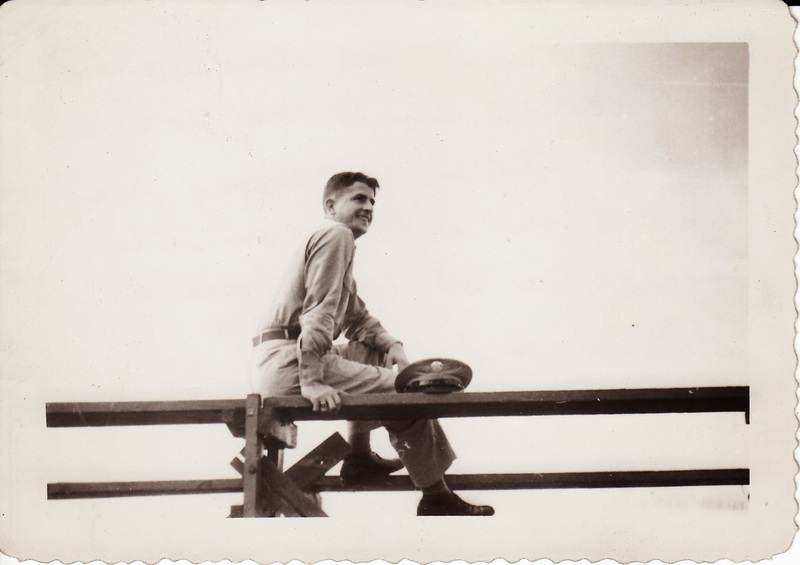 My father didn't enlist in 1943 due to, I believe, a health issue. of young men on campus: most were serving overseas. and was stationed at Fort Riley, Kansas. His artistic ability was put to use and he served as a draftsman. his willingness to serve, his heart for and love of country. those who served reveal to me a selfless love of country. Some people my age resist it but I'm crazy about today's technology. Grandchildren 400 miles away can chat with us while they eat dinner. Today we visited with Lily while she stood at the kitchen counter munching turkey, cheese and grapes for lunch. Not even two, she's already savvy enough to lean toward the phone so that her face fills the screen and give us a big, virtual kiss. Incredible! Ethan was napping on the couch so we got to see him, too. Two nights ago we shared dinner time with Ari (almost 4) and Ashlyn, two-and-a-half. As soon as I appeared on the screen, Ari asked, "where's Popsy and Katie?" Ashlyn piped up, "where's your doggie?" And Ari insisted on seeing the basement, so I marched downstairs, holding the ipad so she could have a basement tour. Thank you to our daughters-in-love who take time out of their days to keep their babies connected with us! It will only get more fun as the children get older and can carry longer conversations. Tonight our sweet, non-confrontational 23-year-old daughter politely asked if we might leave the house for a few hours. How could we say no? She planned to host her Bible study group ... most of whom are young married couples (I think that's kinda funny) and they had a special project in mind. More on that later. We are hopeless homebodies. We fix dinner, we might watch some TV and dabble on our computers. That is the usual extent of our evenings. So when we realized THIS IS THE DAY and we had to figure out something to do, PAST DARK, it took until 1 o'clock to nail it down. We checked movie listings and made a plan. Off we went at 3:30 for a 4:30 showing of a new movie that must be seen to be believed; I cannot adequately describe 12 Years a Slave. True stories always get me and this one happened in the mid-19th century, to a man named Solomon. Go see it and be prepared to cry and horrified that this happened in our country. After the movie we hit Sam's Club for their well-priced cheese and pecans and honey. Then on to Trader Joe's for olive oil and more. I'm so sorry if you don't have a Trader Joe's anywhere near you! We're kind of like the farmers who come to town once a month for supplies in that our town of Delaware isn't so handy to the aforementioned. Finally we had a late (so late I felt European) bite to eat at Chick-fil-A. Oh their sandwiches are yummy. with barely a nod. So cliché, but where does the time go? Dan and Jenny, do you recognize the background? That's right, the beautiful spot where you were married! (And Mark and Jill's reception.) Two weeks ago our good friends Steve and Grace stopped for a couple nights. After a hike at Gallant Woods, Grace and I stopped here at Lehner's for pumpkins. Gorgeous autumn day! We also had that fun, soggy weekend with Mark, Jill, Lily and Ethan in D.C. earlier in October. And I started a part-time job in October ... I guess that has a way of making the time fly. I'm a mother's helper to a wonderful homeschooling family with six children! They needed an extra pair of hands: it's fun and my 4 hours there, three days a week, go quickly. I'm loving it. My oldest, David, turned 30. And my daughter-in-love Jenny also had a birthday. and the World Series happens. sadness. I do NOT like darkness at 5 p.m.! of autumn in Connecticut. The raking here is nothing like the raking there. evenly dividing the work. It was an incredible task. Sadly, Bill and I biked very little this fall. Dad's death, baby Ethan's birth, trips, job, the weather. Biking is on hold til spring, I guess. October biking, two years ago. and some indoor projects over the winter. And books, so many books! Winter, a good time to read. I hope you had a lovely October!